The news reports began rolling in around 10:15 am on Wednesday, 45 minutes after everything had started. Shots in the downtown core, an honour guard shot at the National War Memorial, gunmen on the loose, everyone in lockdown. This kind of thing wasn’t supposed to happen in our quiet, regulated town. It was the kind of thing you heard about on the news, about other places, bigger places. But this is a capital city, after all, so I guess it wasn’t entirely out of the realm of possibility. I was at work, which felt uncomfortably close to the action. After the initial flurry of panic and the exchanging of stories and rumours in the hallways, staff gradually returned to their work. There was not much else we could do with the building in lockdown and telephone and internet communications working only intermittently, so the day continued mostly as normal. Mid-morning, I went to a meeting in a room on the second floor of our building. Its full wall of windows looked out over the eerily deserted street. Partway through the meeting, a voice came over the PA system: “A situation is unfolding. All employees are asked to take cover away from windows and remain in the building. We will notify you of any changes.” Before the announcement was over, the automatic blinds in the room began to close ominously. We suddenly felt more vulnerable. “Of all the other buldings in the downtown core, could ours potentially become a target?” the people in the room wanted to know. No one could be sure. When I returned to my office, our boss had his TV on and had invited employees to drop by to watch as things unfolded. It was an uncomfortable sensation to see our building and the buildings surrounding us featured in a news story beside images of SWAT teams and armed police running through our streets. To suddenly have become part of the news, no matter how marginally, was surreal. After lunch, the clouds began to roll in. Their shadows reached through the windows and fell across the floor and the desks, contributing to the feeling of foreboding. Every now and then that same announcement sounded over the PA system, which didn’t help either. The situation was continuing to unfold, stay away from the windows, do not leave the building. After an hour of failed attempts, my husband and I finally connected and he told me he was outside our son’s school, which was also in lockdown. He and the other parents were unable to get in but he would bring him home when they opened the doors. I had a mental image of parents milling about outside the locked down school. I didn’t feel it was particularly safe but there wasn’t much I could do about it. I felt slightly better when I got my husband’s message that he and our son were at home, but I couldn’t help wondering whether those who were homebound were also supposed to stay away from the windows. As evening approached, employees began to wonder what was going to happen when they wanted to, or had to, leave. With nothing other than the repeated standard message to inform us, some wondered if we would be spending the night in the building. No one wanted to have to leave after dark. But just before 4:00pm, the lockdown was lifted and we were told we could leave at our own risk, as long as we stayed outside a core section of city blocks. The gunman had apparently been shot hours before but there was no confirmation one way or the other about accomplices or additional gunmen. My husband said he and our son would drive up to get me. When I left to meet them, I emerged onto streets full of people. The sun was shining again. It was even warm. Tourists were taking pictures of the historic church across the street. It was as though nothing had happened, as though all the warnings and news and sirens were part of some horror that belonged somewhere else after all. But they didn’t. They happened here. Down the street from my office, down the street from my home, in the neighbourhood where we walk and cycle and run. I could drive myself crazy thinking that if I had gone to work later or had taken a different route, if I had been at an appointment or had biked instead of getting a drive to work, I could have been there. Just as randomly as anyone else. The gunman could have started his rampage at a different place downtown, on a different day. So many possibilities, so many small alternate realities and any one of us could have been caught in the crossfire. And now, to complicate the emotions and our understanding of the situation even further, details are starting to emerge that suggest the gunman wasn’t some evil extremist bent on terror, but actually an individual with mental health issues who had tried to seek help but hadn’t been successful. Perhaps the two descriptions aren’t even mutually exclusive. Perhaps he was both. Like most situations involving human motivation, it is not simple. Heartbreakingly, a young soldier lost his life while he was out there, undefended, in a position of honour. Beyond that one sad fact, I don’t think we have a full picture of the whys or the hows yet. My story is pretty similar to most from that day. We were all in it together and there is nothing particularly special about my recounting. I’m sure this week, and in the days to come, others will write about what happened, just as I have done, as a way to try to make sense of the experience and the after-effects. There are those who were closer to the events, those who were affected more directly. They are the ones with the stories to tell. They are the ones who lost a loved one, or tried to save a life. I think it is human nature to wonder, though, what small little twists of fate tied them tragically or heroically to the events, and what small little twists of fate spared the rest of us. In my dreams, I envision a place. A place I can disappear. Too much has happened in my short life, and most of it isn’t good. If you could see me, if you saw how young I was, you wouldn’t believe half of what I’ve done. Even the young are capable of awful things, though, if they have the right guidance. I can’t tell you about any of it, so don’t ask me. It’s too awful to speak of and anyway, if I did tell you, I’d have to kill you. I’m serious. That’s not just a bad line. More and more often, I dream of disappearing from it all. I guess if I’m honest, I dream of disappearing from myself, too. There’s no way out, but at least I still have my dreams. I don’t know for sure, but I think that most people would choose to escape to somewhere quiet and remote. A beach, perhaps, or an undiscovered waterfall roaring endlessly in the infinite jungle. That sounds nice. Peaceful. But I know myself. Alone is not what I need. I need somewhere in the middle of it all. A place where there are so many people, they would swallow me up. A place I can be anonymous. Somewhere that no one sees me or knows me. Somewhere that I don’t have to think or to see myself. When I close my eyes, the horrors push in and invade my brain. To fight that, I need the dirt and grime and constant assault on the senses one gets from a big city. I imagine somewhere foreign, somewhere I would have to concentrate on the language rather than the visions of what would then, upon my escape, become my past. In my dreams, I envision a place in which all this would be possible. Maybe, if I keep imagining it, I will keep the nightmares at bay. Maybe one day, I will find it. In the city of my dreams, the air smells of exhaust, greasy food frying, cigarettes and cramped society. It’s hot and humid. I spend my time sitting out on a small iron balcony above the fray, looking down upon the masses. Not too high, though. I don’t want to be alone; I still want to be part of it. Unseen yet surrounded. Lights flash night and day. After some time, the rhythm reveals itself. There are lights from the billboard signs, lights from the restaurants and the bars in the busy intersection, lights from the cars and trucks and mopeds, street lights, lights that never turn off inside the shops – pawn shops, luggage shops, shops selling fakes to bargain tourists. The lights pierce through all the cracks, reaching into my private spaces. The fan inside my drab one-room apartment is broken. It makes a thump-thump-thump sound and turns lazily, barely disturbing the air. Air conditioning is non-existent here. The walls are concrete-grey under the peeling, faded, white paint. The floors are as well. Once-white curtains billow in the languid air, showing the marks of decades of pollution. Dirty dishes are piled in the sink and on the drain board. Whether I open or close the windows, the stench seeps in. And the noise. Cars and trucks honk, gears grinding, as they break any traffic rules that may once have existed. People call to each other, scream at each other, embrace each other; the complex, emotional interactions of humanity. I hear it all, see it all, smell it all. And what do I do all day? I sit and watch and try to forget. I don’t know how much time I have – perhaps a lifetime – but whatever I have, it is a luxury to be away from the horrors. To do nothing. Even waiting isn’t so bad; I want to be ready if they come for me. stretching on infinitely before me. not the me that I was then. being home with my family. Inspired by Ray Bradbury’s noun list. Today is momentous in its own small way. To me, at least. It was a year ago today that I published my first post. I know I’ve talked about why I write in several places already but I think this is a good occasion to again stop and consider what I get out of the experience. Silverleaf was a name and a persona I dreamed up over 20 years ago, when I read somewhere that witches and other practitioners of earth-based belief systems did that sort of thing. Made up names, that is. These names were, according to the source, usually composed of an adjective (often a colour) and a noun (usually something found in nature). It was a stormy summer day and as I looked out the window, I saw the leaves in the maples swaying and turning, showing their silver undersides. I felt a connection. I’ve since discovered I’m too atheist to believe in anything, but Silverleaf floated up into my consciousness when I was trying to think of a pen name. The connection to those swaying trees still exists. 20 years ago. I was still writing then, still dreaming of contributing to Canadian literature in some way. My father wanted me to become a journalist but even then I knew that the competitive, ambitious life was not for me. I just wanted to be a poet. No, scratch that. No words of judgement. I wanted to be a poet. Funnily enough, it was my current hair dresser who suggested I start a blog. 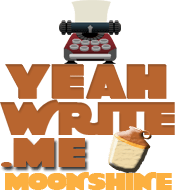 He was surprised I didn’t already have one and said, “you of all people should have a blog.” I say this is funny because I don’t think we’ve ever talked about writing. He’s from the countryside of Quebec, and has a very heavy accent. At times I have trouble understanding him at all. And though I consider myself bilingual, English is definitely my mother tongue. Since we conduct all our conversations in French, I don’t exactly wax poetic while he’s trimming my hair. I still don’t know what it was that made him so sure I should be blogging, but am I ever glad he encouraged me. I still thank him every time I get my hair cut. It took me several weeks of mulling the idea over – and the beauty and inspiration of staring out at the sea – before I acted. Now, I have a place of my own creation. A place that is all mine. A place where I can be whoever I want – but where I am always and only the very deepest version of me. I could never be anyone else. I like the feeling of freedom I have built for myself, the freedom to not censor and to hide nothing. I am secure here, secure that I can do and say and be my true self. I can organize the décor, share the pictures and thoughts I want. I can sit down and tell you a story or wax lyrical about the beautiful moon. I can tell you what I would tell a private journal, about my anxieties, my worries, my fears and my hopes. I have at times gotten very personal. And you have always been supportive and willing to reply to whatever it is I throw out there. This is also the place I come to grow as a writer. At the beginning, I wrote a lot of poetry and the odd bit of fiction. I wrote some stories that I am still quite proud of, though many remain rough and in need of a good edit. Stories like Lily, Artifact, and Mina’s Coffee, though the latter is really more of a character sketch, continue to languish in my archives, buried under everything else I’ve written since. As the blog has developed and as I have grown, I have worked more and more on my fiction. This is especially the case since I happened upon the Speakeasy in January. I’ve started adding posts dedicated to photographs, too. But whether I am sharing photographs, poetry, my innermost secrets or telling a story, there is one thing I have discovered: I love writing. It makes me happy. I knew this 20 years ago but I forgot it somewhere along the way. The blog experience has also shown me just how much I love writing for an audience. The community I have found here has brought me laughs, tears, editorial critiques and has reassured me. I have made friends who now mean a lot to me. People leave the nicest, and sometimes funniest, comments here. They really boost me on a difficult day, and make the bright days even brighter. Whether I am writing about how zataar can keep the cold darkness of the approaching apocalypse at bay, about my husband’s homemade marmalade, or how the Lowest of the Low’s song Rosy and Grey catapults me back into the wintertime of my sixteenth year, I am fulfilled. I am proud. I have shared a small piece or a large chunk of who I am and I have done it earnestly and honestly. I think that, for me, is the greatest joy in writing. I don’t know how this story, the story that is my blog, will end. Round and round and round I go and where I stop, nobody knows. The ending is a mystery. Or maybe there is no ending. Maybe I will never stop. Thank you to everyone who has joined me during this year. Your readership, likes and comments are more fulfilling that I can express and, on those difficult days, they are what keeps me writing. Someone asked me, while I was on holidays, whether I was a different person at home. She suggested that getting away, meeting new people, going to a new country allows you the possibility of reinventing yourself. I suppose that’s true, If you’re so inclined. Which I’m not. I couldn’t reinvent myself if I tried. Travelling with your family – those who know you best, who know you intimately – also makes it hard, but even on my own I am still me. Have I changed and morphed over the years? Sure. I’ve worked hard at self-improvement. But the heart of who I am remains the same. The same person, not getting anywhere with her first line of questioning, asked instead what I was like when I was 22. The original me, before marriage and kids and real life had settled in. 22 was a while ago. 22 was just after my dad left. 22 was before I moved to Ireland for 5 years, alone. 22 was before I married, had my son, divorced, re-married. 22 was before I had a real job. 22 was before I had any real responsibilities. I had barely tumbled out of a childhood which, at the time, I was sure had been horrible, painful and unfortunate. I was angry about all that but I was also out for a good time. Free at last. I made plans on the fly. I went out when the feeling struck. I stayed out as late as I wanted. I ate standing at the kitchen counter. I was high on the possibility of disappearing for days and no one knowing I was gone, no one needing to know when I would be back. I did what I wanted and tried to pull my friends along with me but if they weren’t game, I continued on my path anyway. My path to reckless abandon – although in my case, it wasn’t all that reckless. Everything is relative I guess. I didn’t have to worry about any one else depending on me, not the way a child does, and though I was dependable as a friend and a daughter (I hope), I steered my own course. I did my own thing. I did enjoy the moments, though, after my dad left when my mom and I were both home together. That was a home I felt comfortable in. No angst, no looming anger. I wasn’t an angel – by far! – but any arguments we had were of the normal parenting variety. At 22, I was a bit more relaxed about daily life than I am now and a bit more fiery deep down (or maybe it wasn’t so deep…). I had the flexibility to do what I wanted, when I wanted. But otherwise, I was still me. I still got up on time, I handed in schoolwork on time, I was a responsible pet-owner (an iguana, in case you wondered). I wrote, I read, I biked, I enjoyed nature, I cooked, I was honest to a fault and equally stubborn, I was energized by my friends and by learning, I enjoyed alone time. Nothing there has changed much; I am me whether I am on vacation, with my family, meeting a friend, or at work. I remember, too, that at 22 I was searching for an identity, which I was sure I would find in Ireland. And I was right, I did. But I was surprised to find out that my identity wasn’t Irish. Going to Ireland, I realized just how Canadian I was. Returning to Canada, having my own family, going through divorce, job moves and house moves, and re-marrying and re-building my life has either added on layers of “me” or else has exposed the person at the heart of who I really am. I’m not sure which; maybe they’re both the same thing. Or maybe it doesn’t matter. I am the sum of my parts. Like a complex, interwoven, multicoloured tapestry. I am a mixed up jumble of things that makes up an identity. And I am that mix of me every day, all the time, in every situation.